The new four story Centennial Hall at Aurora University represents the University's commitment to meet the growing demand for on-campus student housing. A private liberal arts institution in a historic neighborhood district in Aurora, Illinois, Aurora University has enjoyed significant academic and enrollment growth since the beginning of the millennium. Last year's freshman class of 500 students represents a 265% enrollment increase since 2000. With enrollment more than doubling, the University was faced with providing housing for those who wanted it. Five existing on-campus Residence Halls accommodate 670 students, with one-third of them living in triple rooms. The New Hall, the sixth on campus, provides another 115 beds for some of the nearly 700 undergraduate students requesting housing. The new 27,700 sq. ft. hall is constructed as a free-standing building instead of an addition to an existing hall, in order to preserve a historic grove of pine trees. The building incorporates sun shades to enhance energy savings and the structure's aesthetics. Its exterior enclosure is designed with insulated masonry cavities to control air and vapor flow and increase the building's energy efficiency. The relationship between Aurora University and Cordogan Clark & Associates has been a long term collaboration for the University's Master Planning and many university projects since 1989. Since demand for on-campus housing continues to grow, the University and Cordogan Clark, together with Boldt Construction, teamed again to build a new residence hall. The new four-story Residence Hall for Aurora University provides rooms for 115 students. It is part of comprehensive campus improvements including new facilities as well as renovations of existing ones. It is designed to help meet the housing needs created by the University's growing enrollment. Located on the southwest side of campus, the new Residence Hall reflects the overall architectural design of the campus. The red-brick and cast-stone detailing is reminiscent of some of the original campus buildings yet is also infused with contemporary design elements. It creates a "second quad" bound by Watkins, Memorial and Davis Residence Halls and the new Institute for Collaboration, an innovative center designed as a learning laboratory for teachers also designed by our firm. 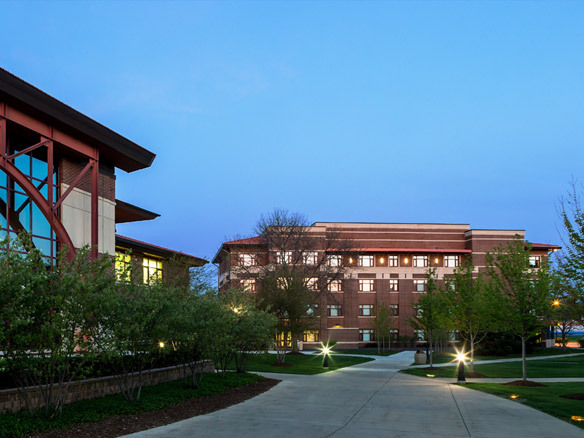 The technology-rich Centennial Hall provides single- and double-student rooms, rooms for resident assistants on each floor, as well as space for a Residence Hall Director on the first floor. Each floor features shared student community rooms and bathroom / shower spaces. A larger student community lounge area is located on the first floor, along with laundry and mail rooms. At 27,700 square feet, its scale is intimate enough that all students can feel part of a "campus community." It encourages a sense of belonging and 'place.' This provides students a friendly transition from home to dorm life.